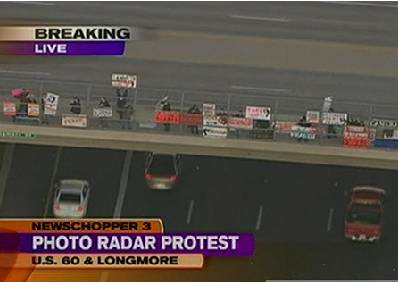 Join other CameraFRAUD volunteers this Friday for another fun, horn-honking freeway overpass demonstration! EAST Valley vs. WEST Valley! “Sign waves” are great opportunities to raise awareness with the public about automated ticketing and the “surveillance state” tactics being utilized by Redflex and ATS against the people on a daily basis. Bring your own sign or use one at the demonstration! Use the comments section below to discuss this event! 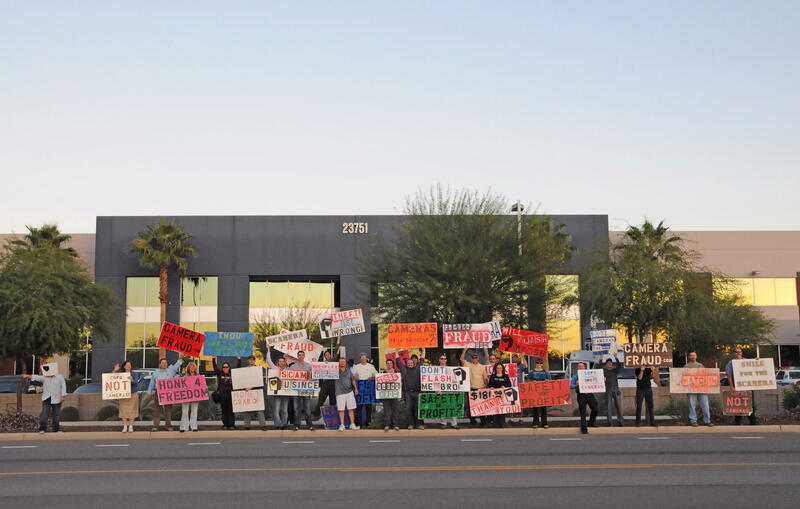 An unannounced protest last Friday morning targeted an American Traffic Solutions’ van in Mesa as well as a Redflex van in Tempe. Numerous volunteers from CameraFRAUD appeared for a “flash mob” around 7 AM. Large signs reading “Scam Cam Zone”, “Pirates Ahead,” as well as”Fraud Alert” were used to warn drivers of the speed trap ahead near University and Stapley. Many motorists honked and yelled in support of the demonstration. Time is money with profit-rich photo radar vans. Any disruption to their operation could instantly destroy their profit margin for the day. 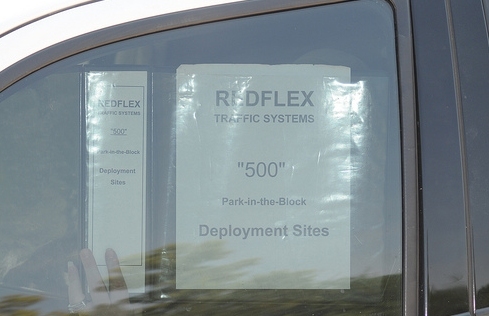 With the early Mesa victory, it was off to an unmanned Redflex van in Tempe near McClintock and Elliot. Tempe police eventually arrived but watched from a distance. Concerned about their equipment, Redflex dispatched an employee to the scene. For some reason, the talivan operator didn’t want to be identified, and tried to duck into a large book full of policies and procedures. The unannounced demonstrations will continue. Its time to make another great showing of solidarity and determination. Automated ticketing and overzealous surveillance will no longer be tolerated in the Grand Canyon State. Come on out anytime between 3:00 and 7:00! Also a good idea: Forward this event to a friend, call a co-worker with the news, or for you Twitter users why not consider posting an update to your account? Members of the “Liberty Restoration Project” recently held a demonstration opposed to the use of automated ticketing machines in Kansas City, MO. They are supporting state Senate Bill 211 which would ban the practice outright. In Maryland, members of CameraFRAUD DC held a small rally which drew the attention of NBC Washington. “Do you really think that these people came out today because they want to be able to drive too fast?” said one forum participant on the NBC Washington website. 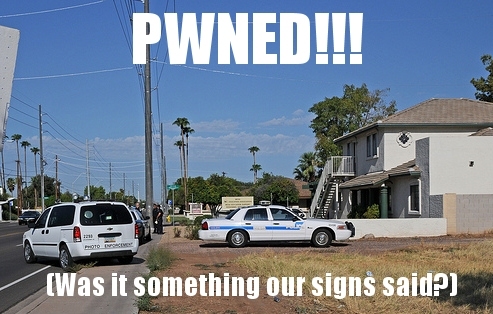 In Arizona, CameraFRAUD plans to hold a rally on Friday afternoon in the Phoenix-suburb of Chandler. Past demonstrations in Arizona have drawn hundreds of participants and captured the attention of local media. East vs. West Sign Wave / Demonstration + Sign the Initiative! CameraFRAUD will be holding TWO simultaneous demonstrations / sign waves to see which side of town is really serious about the cameras coming down! Come on out to also sign the ballot initiative outlawing photo enforcement in Arizona.